NEW YORK TIMES BESTSELLER • From one of Barack Obama's most trusted aides comes a revelatory behind-the-scenes account of his presidency—and how idealism can confront harsh reality and still survive. 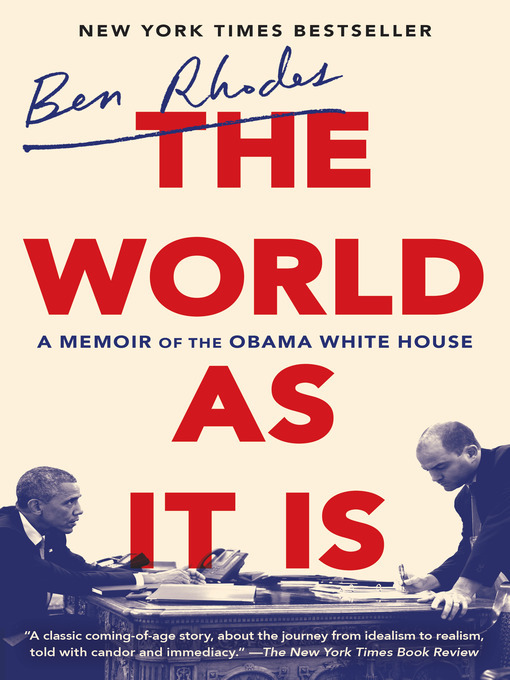 For nearly ten years, Ben Rhodes saw almost everything that happened at the center of the Obama administration—first as a speechwriter, then as deputy national security advisor, and finally as a multipurpose aide and close collaborator. He started every morning in the Oval Office with the President's Daily Briefing, traveled the world with Obama, and was at the center of some of the most consequential and controversial moments of the presidency. Now he tells the full story of his partnership—and, ultimately, friendship—with a man who also happened to be a historic president of the United States. In The World as It Is, Rhodes shows what it was like to be there—from the early days of the Obama campaign to the final hours of the presidency. It is a story populated by such characters as Susan Rice, Samantha Power, Hillary Clinton, Bob Gates, and—above all—Barack Obama, who comes to life on the page in moments of great urgency and disarming intimacy. This is the most vivid portrayal yet of Obama's worldview and presidency, a chronicle of a political education by a writer of enormous talent, and an essential record of the forces that shaped the last decade.